Which district of Canyonlands will you explore? Unless you’re planning to drive through the park for several days, you’ll likely want to pick one district of the park where you can focus your attention. Here’s a quick description of each to help you decide. This towering mesa section of the Park, is aptly named. Sheer cliffs and steep drop offs make for inspiring panoramic views. 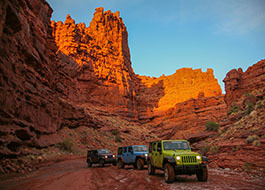 Due to its paved roads, close proximity to Arches National Park and the town of Moab, Island in the Sky is the most popular and accessible area of Canyonlands National Park. The Needles district is home to a garden of colorful sandstone spires shooting up from the desert floor. Needles is famous for it challenging 4x4 trails, endless backpacking trails, hidden arches, and petroglyphs and pictographs which date back to the indigenous people of Moab. The Maze is the most remote and least accessible district of Canyonlands National Park. The maze district is a siren call to visitors looking for Solitude in an unfathomable redrock wilderness. Travel to the Maze requires a greater commitment of time, typically three to seven days, and a good degree of self sufficiency and competence in a rugged environment. 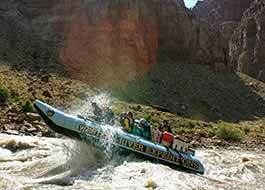 With so many ways to recreate within Canyonlands National Park, one of the most sought after is rafting. The Colorado River, through Canyonlands National Park, offers pristine and tranquil flat water sections, as well as some of the country’s most taunting and tumultuous whitewater rapids. The incongruencies of Colorado river, powerful enough to cut through canyons,so nurturing Great Blue Herons, Canyon Wrens, river otter and even people frolic in its waters and bask along it’s shores, has enticed humankind for centuries. 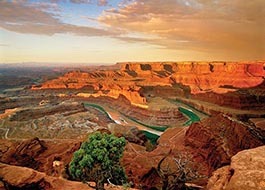 Only have one day to spend in Canyonlands National Park? No problem! The Island in the Sky District offers the wonderful opportunities for sightseeing by car and is the most accessible. The 34-mile round-trip scenic drive features awe-inspiring overlooks, from a 1,000 feet above, of the valleys below and the other districts of the park. You could spend as little as an hour in the park, but we bet you’re going to need at least double that to take it all in. The Needles, though not as easy to access, also offers an incredible scenic drive that can be done in a day. Continuing 6.5 miles drive past the visitor center and ending at Big Spring Canyon Overlook, this stunning driver has several pullouts to short hiking trails, viewpoints and picnic areas. You could take days, even weeks to drive around Canyonlands National Park and still not see it all. However we encourage you to give it your best shot. If you have two days to spare, take one day to explore Island in the Sky and the other for the Needles District. 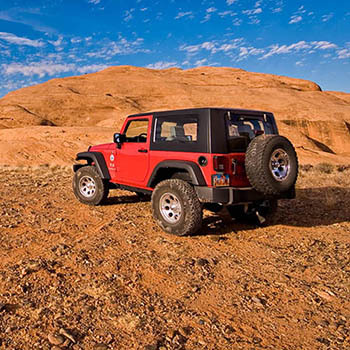 Much of Canyonlands is only suitable for 4x4 vehicles. These four-wheel-drive roads start at an intermediate difficulty and range to extremely technical. Make sure you have an appropriate vehicle well-equipped for the terrain and please do your research before attempting any off road trails.